Araújo, E., Barreto, P., Baima, S., Gomes, M. 2017. 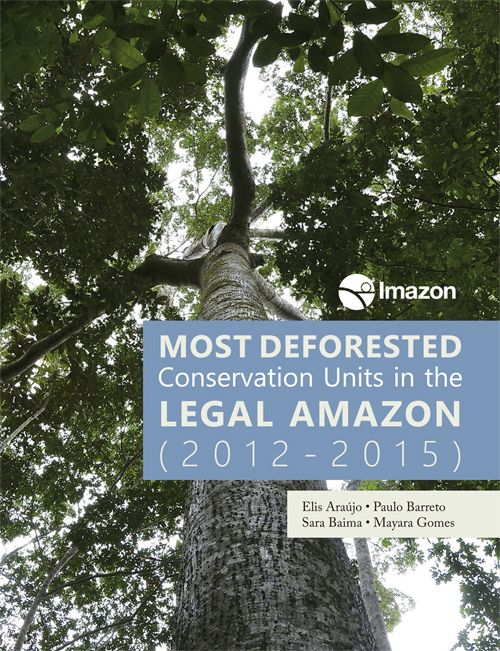 Most deforested Conservation Units in the Legal Amazon ( 2012 – 2015) (p. 92). Belém: Imazon. Conservation Units (Unidades de Conservação – UCs) cover 22% of the Legal Amazon and are an effective strategy to preserve animals, plants and environmental services, and also to halt deforestation and to maintain the planet’s climate balance. However, deforestation rates in UCs have been increasing – in 2015, they already surpassed the 2012 rate by 79% – and its participation in Amazon’s total deforestation increased from 6% in 2008 to 12% in 2015. As a consequence of the deforestation of 237.3 thousand hectares in UCs between 2012 and 2015, equivalent to R$ 344 million in appropriated lands, approximately 136 million trees were destroyed, causing death or displacement of approximately 4.2 million birds and 137,000 monkeys. In addition, we estimated that the burning of vegetation in this deforested area has emitted 119 million tons of carbon dioxide equivalent per year – which compares to 80% of Brazil’s car fleet emissions in September 2016; and that this deforestation generated gross income of R$ 300 million from the sale of timber (value of standing timber), creating a huge investment potential in deforestation. In this context, we identified the 50 most deforested UCs between 2012 and 2015 in the Legal Amazon, which represent only 16% of the total UCs in the region. Overall, they lost 229,900 hectares of forest, that is, 97% of the area deforested in UCs between 2012 and 2015. These UCs in critical deforestation situations are in the area of agricultural frontier expansion and under the influence of infrastructure projects, such as highways, waterways, ports and hydroelectric power plants. Most of the deforestation detected in the period, 49.8% and 38.9% is concentrated in the states of Pará and Rondônia, respectively. The federal UCs are in a larger number on the ranking (27), but the state ones presented a greater deforested area (68%). The vulnerability of these areas stems from systemic failures of the government, which has a duty to protect them. Among these vulnerabilities, we highlight: i) the erratic and limited strategy of the government, which consists of changing rules and weakening environmental legislation according to current interests and tolerating illegal deforestation until 2030; ii) the scarce human resources for management and the worrying trend of a reduction in the number of federal environmental analysts stationed in the Amazon, 40% in ICMBio (2010-2016) and 33% in Ibama (2009 2015); iii) insufficient financial resources to make the necessary investments to implement the UCs – only 16 critical federal UCs in this study would need R$ 10.6 million per year, which is 3.26 times higher than the average of ICMBio investment resources between 2014 and 2016 for the whole country and 3.42 times higher than that projected for 2017; iv) the ineffectiveness in execution, which is revealed in the low application of available financial resources. For example, between 2009 and 2014, ICMBio used only 35% of the R$ 218 million received for environmental compensation; the slowness in combating irregular occupations, which causes environmental and social damages; and the low rate of punishment for environmental and agrarian crimes. Ensure immediate protection of the most critical areas and their populations. It is necessary to protect the local populations of the Amazon, such as indigenous peoples and rubber tappers, who have fought and continue to fight for the creation and maintenance of protected areas. Several agents, besides the police, could contribute to this. Social and environmental NGOs, governments, and international and national donors could increase support for these populations and the implementation of the areas based on the experiences of PPG7 (G7 Rainforest Protection Program) and Arpa (Amazon Protected Areas Program), which permitted the creation of tens of millions of hectares of protected areas in the Amazon. In addition, they could also support the long-term implementation of UCs, as Arpa intends to do. Religious leaders and their followers could step up support for conservation based on Pope Francis’ Encyclical Letter, which calls for forest conservation as part of the effort to care for the common home (the planet). Military forces could intensify their action in the fight against deforestation and the land grabbing of public lands in areas of greater conflict. In addition, the Public Prosecution Service and the Courts of Accounts could hold public administrators accountable for reducing the area or degree of protection of UCs to meet the demands of squatters illegally occupying public property, based on the Law of Responsibility of the President of the Republic and of the Ministers of State and in the Administrative Improbity Law. Block the demand and financing of illegal deforestation. There is a need to increase the pressure on businesses to improve and expand their commitment to sustainability. To this end, Public Prosecutor’s Service and environmental agencies could increase the liability of companies that buy products from illegally deforested areas and those that finance such activities. They could also monitor the implementation of Resolution No. 4.327/2014, which requires financial institutions to establish and implement the Social and Environmental Responsibility Policy (PRSA). NGO campaigns and investigative reporting on law-breaking companies could strengthen such accountability actions and protect companies that comply with laws and agreements from unfair competition. In addition to boycotting illegal production, it is essential to stimulate sustainable production in areas already deforested outside UCs. However, public credit directed exclusively to the most sustainable practices in Brazil (ABC Program – low carbon agriculture) will represent only 1.6% of the country’s total rural credit in the 2016-2017 Agriculture and Livestock Plan. But the financial sector could help scale up sustainable production initiatives by engaging more strongly with governments, producers, and supply chain partners (such as traders, slaughterhouses, supermarket chains) to identify opportunities and remove barriers.